This simple yet opulent shrine is made of Japanese cypress Japanese cypress, richly gilded and coated on black and red lacquers. 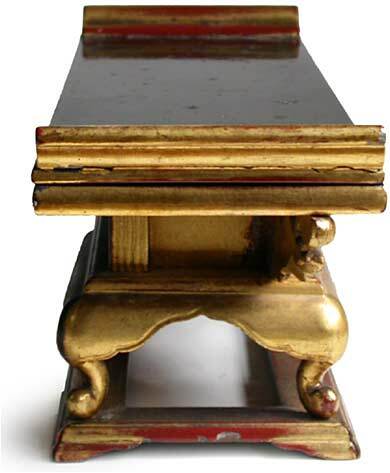 It consists of a removable upper tray platform, and a small rectangular table decorated with carved floral motifs, with the mid section flaring outward into a rounded drop-leaf, which is supported on four curved legs above a small wood frame. The shrine's simple yet graceful design added much strength to the construction. Given its size, the gilded shrine weighs barely at 28 oz. It is an excellent example of the traditional Japanese carpentry technique, which can be traced back to early 7th century.